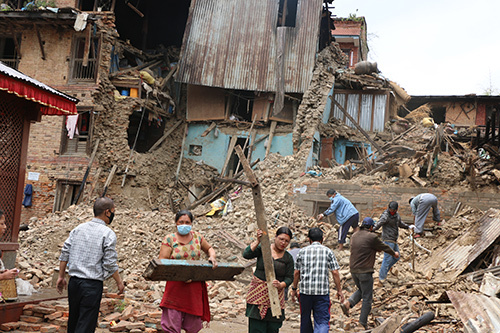 UNITED NATIONS, New York/BUNGMATI, Nepal – Needs are quickly escalating in Nepal, in the aftermath of the 7.8-magnitude earthquake. The most recent UN estimates indicate more than 5,000 have been killed and 8 million people have been affected. Based on the latest available data, UNFPA now estimates some 2 million women and girls of reproductive age are among those affected – including some 126,000 pregnant women. 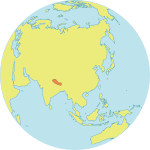 The Government of Nepal has declared a state of emergency. Disease risks are a growing concern, and communities are sleeping outside for fear of aftershocks, which continue to convulse the area. Women and girls are among the most vulnerable. UNFPA has rushed the delivery of reproductive health kits, which contain the supplies required to support safe childbirth. UNFPA is also supplying dignity kits, containing essential hygiene supplies for women and girls of reproductive age, including soap and sanitary napkins. UNFPA and partners are also working to prevent gender-based violence, which is known to increase in the aftermath of disasters. Bungmati, on the outskirts of the capital, Kathmandu, is one of the hardest hit places in Lalitpur District. Survivors are crowding into temporary camps, some living under tarpaulin strung from the ruins of buildings. Women and girls urgently need support, survivors told UNFPA. Nursing mothers, women and adolescent girls all emphasized the need for nutritious food, sanitary napkins, warm clothes, soap and medicines, as well as more tarpaulins. Sanu Chori Maharjan, 36, was on the roof of her three-story home when the earthquake struck. She was lucky to have escaped unharmed. Now she and her 9-year-old son are living with other women and children in a temporary shelter. Nursing mothers have a particularly acute need for nourishment and hygiene supplies, Ms. Maharjantold UNFPA. Laxmi Shakya, 31, is one such nursing mother. 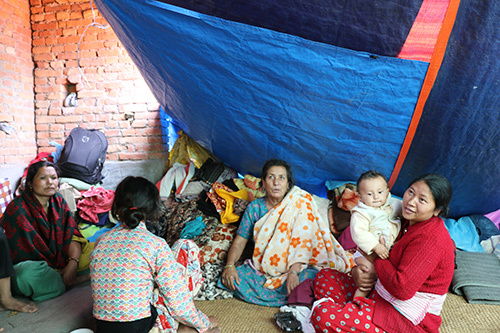 She had delivered her second baby just three days before the quake. She was breastfeeding her infant son when the ground began to shake, said. Ms. Shakyaand her children were not hurt, but they are now living outside, and their future is uncertain. Fifteen-year-old Sharalata Bramacharya says girls need hygiene supplies, including sanitary napkins. Her family is living in a temporary shelter, and she and her mother have been able to collect drinking water from a nearby well. Others are not so fortunate – water scarcity is a major humanitarian concern. UNFPA staff have been deployed to assess and address the needs of survivors. Shipments of aid materials have arrived and are being distributed in the worst-affected districts.